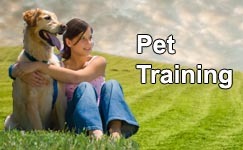 Warn your pets away from trouble with a high-pitched alarm and a startling burst of air. 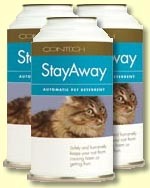 The StayAway automatic pet deterrent protects your porch, patio, potted plants, and countertops. Just place it in the area you want to protect, and the StayAway does the rest. When a cat approaches the area, the StayAway responds with a warning sound and a brief spray of "compressed air" to warn your pet away. Once your cat learns to recognize the warning sound, you can switch to the "sound only" mode to conserve compressed air for an even more economical solution. 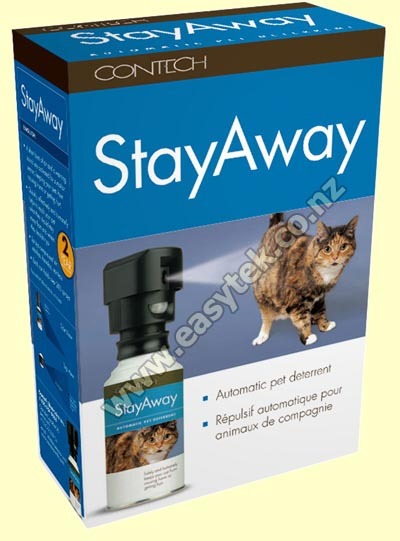 operates up to 200 times on a single, replaceable canister of "compressed air"
The StayAway automatic pet deterrent uses a passive infrared sensor to detect an animal within its one-meter zone, and responds with a warning sound and a brief, harmless spray of compressed air. To set up the StayAway, simply place the unit in the area you want to protect, (for example kitchen counters, potted plants, etc.). Turn on the sound/spray, and wait a few seconds for the motion detector to stabilize. The StayAway is now set to go. For the first few days, use the combined sound/spray mode. When the motion detector detects a cat's movement, it will first respond with a sound, followed by the spray of air. After a few encounters with the StayAway, most cats will decide that the sound is enough to warn them from off-limit areas. The StayAway automatic pet deterrent is constructed of durable, high-quality materials, and has been designed to provide many years of reliable service. A five-position motion sensor detects motion up to one meter away. Each replaceable can of compressed air holds over 200 sprays. Detection and spray angles can be adjusted individually. Two different modes of operation: sound with spray and sound only. StayAway reviewed by Hayley L., Christchurch on 2017-02-20 . StayAway reviewed by Glenys H., Lower Hutt on 2015-11-07 . I'm only putting the quality at 3 because one of the cans has stopped working. I'm not sure whether it's the new one or the old one. I will have a fiddle in the next few days and see if I can get it working. StayAway reviewed by Richard T., Wellington on 2015-06-02 . StayAway reviewed by Basie B., Whangarei on 2015-03-08 . StayAway reviewed by Charlie R. on 2014-06-26 . StayAway reviewed by Kimber A. on 2013-09-30 . Very pleased with this product, very effective and simple. Very pleased with a previous purchase. Quality was good. StayAway reviewed by Vanessa M. on 2013-09-26 . StayAway reviewed by Pip J. on 2013-08-09 . Extremely dissatisfied. Product did not work. All it did was make a noise, no spray. All connected properly, but no spray so the product was not effective. I phoned through only to be told it would be at my cost to send the product back for testing. StayAway reviewed by Andrew C. on 2013-06-03 . Much quicker than trying to bring into the country myself, despite more expensive. Better to buy the more expensive product that allows for behaviour reinforcement without ongoing consumable expense (refill cans) Cheaper carpet insurance.